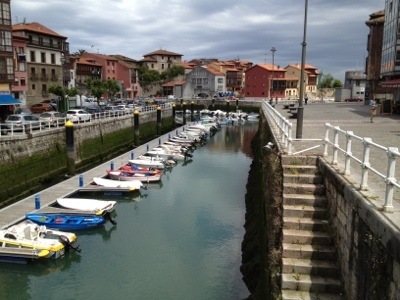 Day Ten: Colombres to Llanes — After breakfast in the deserted breakfast room I gathered my things, paid for my laundry and dinner, and stepped out into the day. 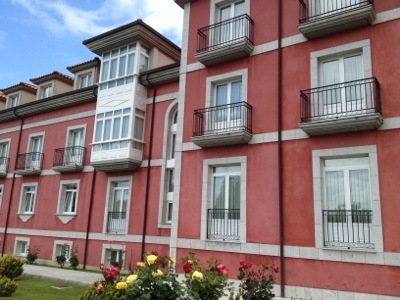 I knew the camino route followed the highway, so I walked down the motel driveway and faced oncoming traffic from the narrow shoulder of the road. The lack of scenery along the wide expanse of asphalt allowed room in my thoughts to reflect on last night’s dinner conversation. The best dinner conversations I’ve enjoyed over the years follow an unspoken protocol. The host or hostess, in addition to making sure everyone has enough to eat and drink, subtly guides the conversation so that everyone at the table is included. The goal is for all to participate and for everyone to have a good time. Others at the table help by being certain not to dominate the conversation and, after they’ve spoken, by asking a leading question of someone else at the table. A dinner party, then, is a lot like a basketball game. The ball (the conversation) should be in constant movement and everyone should get it regularly. If someone doesn’t pass the ball to others or if two teammates make all the plays, the other players might as well go sit on the bench. Good basketball teams don’t happen by accident — they take coaching and practice. The same is true of conversation. Get six strangers together and you don’t really know what will happen, particularly if some of them don’t know the game. Which brings us to last night. Along with the three youngsters (American, Québécois and Dutch) I was joined by an older, married pilgrim couple who described themselves as “from Europe.” As the conversation developed it was clear that the focus of the older man’s attention was the young, female American pilgrim. With a few exceptions the conversation among the six of us became a conversation between the two of them. No one among us, myself included, seemed quite able to shift the focus. I tried several times to draw out the older woman, hoping we could wrest the attention to a different axis, but I couldn’t quite pull the whole table along. 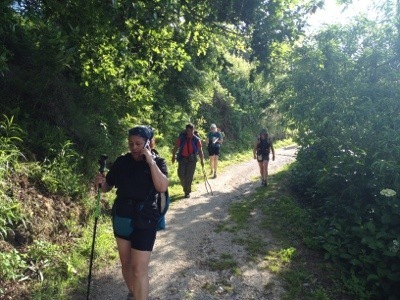 It reminds me of a scene from last year’s camino. I was sitting at dinner in a small albergue, enjoying the conversation with three pretty French women across the table. I poured them a refill on their wine and then heard a voice from the older woman next to me saying, “don’t just pour for the young women. I’d like some wine, too.” I hadn’t realized until that moment that I had been focusing on the pretty, young table mates. That night I needed to remember that dinner conversation is like basketball. At our conversation last night if we’d had more dribbling and passing and more team involvement I think we’d all have had a better time. Soon it was time to turn off the main road to a smaller road on the left, which led to a gravel road that followed along and above the highway. After a time this road returned to the highway once again. At Buelna I followed the guidebook’s directions to cross the highway, descend through the town, and find the GR-E9. The “GR” denotes it as one of the “Grand Route” walking/biking trails of Europe and its wide, well-graded gravel trail way became the route for most of the rest of the day. 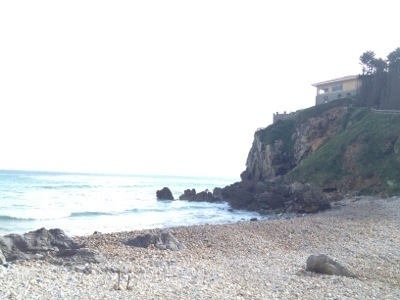 The E-9 followed the coastal cliffs and occasionally offered panoramic views or quiet, isolated beaches. The kilometers melted away accompanied by the sounds of murmuring creeks and crashing ocean waves. I enjoyed seeing the five Spanish women briefly (Begona, Annabelle, Pilar, Nuvia, and Anna), along with a French couple and Czech foursome I’ve seen several times recently. Eventually the trail came to the town of Andrin where I stopped for breakfast #2, enjoying a delicious tortilla espanol. I hadn’t carefully looked at signs to find the way from the restaurant, so I guessed that the road headed west out of town. Wrong. After walking 1 km the wrong way I asked directions and headed back, almost to where I began, and found the trail as it climbed a steep hill. 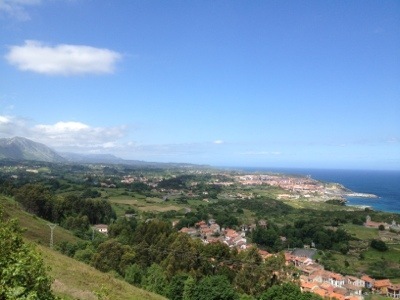 At the top of the hill was a spectacular vista of the ocean, with a full view of Llanes ahead. I followed the signs and was once again on the E-9. 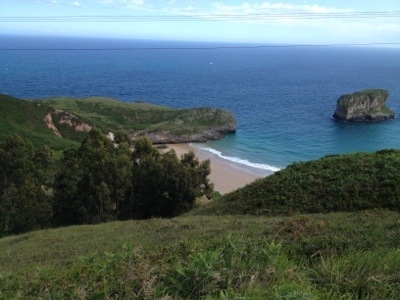 The trail led below then above the highway and then took a steep climb to a TV tower above Llanes. 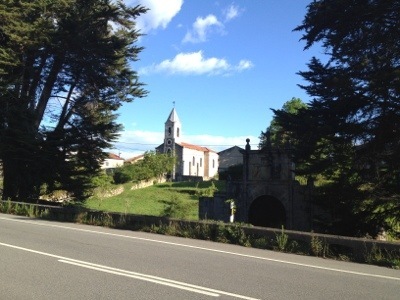 For a time it seemed as though this route would bypass Llanes, but eventually it descended and connected with Llanes’ main route. As I came into town I noted the name on Google Maps of a large hotel. When I passed it I liked its quaint and dignified style and couldn’t resist going to the front desk and asking the cost. At this moment I’m enjoying the view from one of the hotel’s elegant and surprisingly inexpensive rooms. Today I’m missing home and also my pilgrim friends. But I’m also happy to have some quiet and rest in a lovely place after a good day’s walk. All told, things are going very well. If you’ve read this far into today’s entry, thank you for your kind attention. Off to bed now after a big, late lunch. No basketball for me tonight. 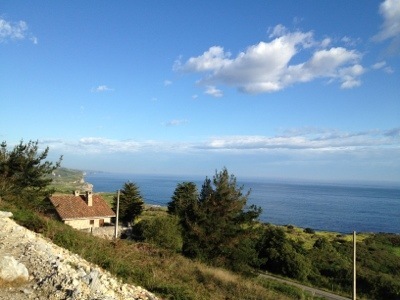 This entry was posted in Camino del Norte 2012 and tagged Andrin, Colombres, Llanes by SandyBrown. Bookmark the permalink. Hi Sandy ! Just sending a note of encouragement from Alaska. I have been following your walk this year since day one. Also your previous Camino’s. Just finished reading your CF 2011 with great interest ( as we will walk this path next spring ). 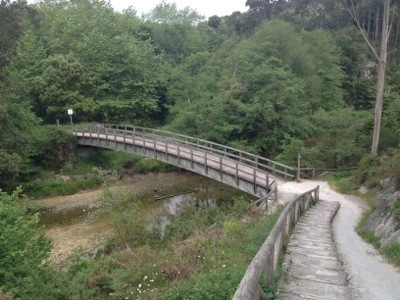 We had walked from Serdio to Llanes and I thought also that path brought us out of our way and very very long distance….a friend had gone ahead (on bus) and had made a fine meal for us, I was rude that night! so tired, couldn’t eat and said little, a german man celebrated his 60 birthday and offered me (only me) a glass of his Cava, I took it and enjoyed it, his lady friend glared at me? (not partner/found out later) we called her the panzer tank (oh we were quite bold with the pilgrims nick names). 6lb wow you doing well, over 33 days I lost 5kg, Off this weekend for yoga and walking, look forward to all your posts.